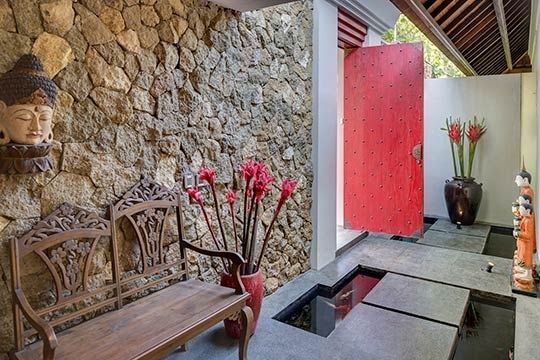 From the sound of water features to the scent of frangipani, the feel of sculpted stone to the sight of myriad objets d’art, Des Indes Villa II delivers a rich sensory experience the moment the scarlet doors swing open and smiling staff place a cool towel and welcome drink in your hand. Within this oasis, an expanse of swimming-pool turquoise is complemented by furnishings accented in burnt-orange, a hue that’s echoed in the traditional patterned tiles on the living room floor and in the statues of saffron-robed monks standing sentinel along the wall. 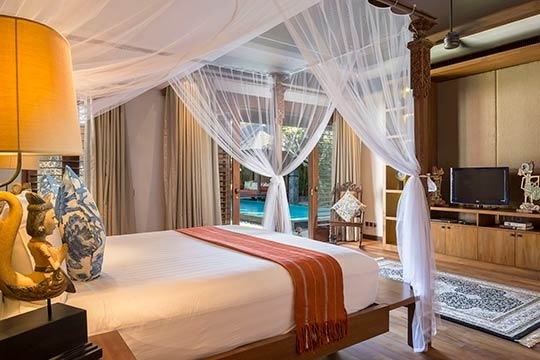 Holland’s legendary Hotel Des Indes inspired the name as well as the colonial-influence interiors for this two-bedroom luxury villa, which offers a contemporary take on old Bali-style open-concept living and Asian heritage chic. Vaulted ceilings soar above vibrantly patterned oriental rugs on polished teakwood floors. 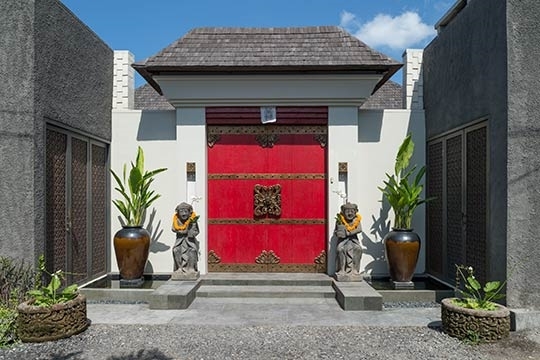 Intricately carved decorative panels and woven rattan doors show the hand of Bali’s master craftsmen. 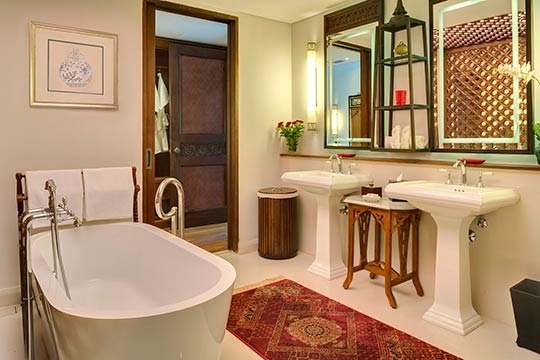 And every room is brimming with antique-style furniture, heritage colonial pieces, designer lamps, Chinese ceramics and Asian curios. 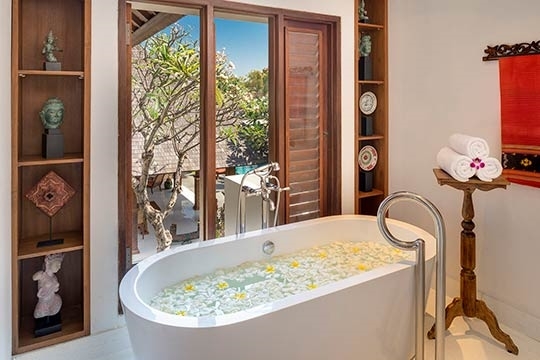 These are balanced with contemporary luxuries – curved-screen TVs and top-range bedlinen in both bedrooms, for example, and Body Shop toiletries and air-conditioning in the bathrooms. 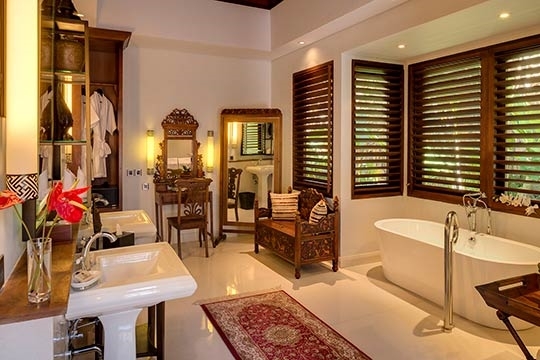 Des Indes Villa II has just emerged from a major renovation (late 2015) and feels sparkling new in some ways. But some things don’t change – friendly old-fashioned service, for example. There’s always a butler on hand to serve cocktails and snacks, and an accomplished chef to prepare meals from a reasonably priced menu that are more than a match for the many restaurants that are within walking distance of the villa. 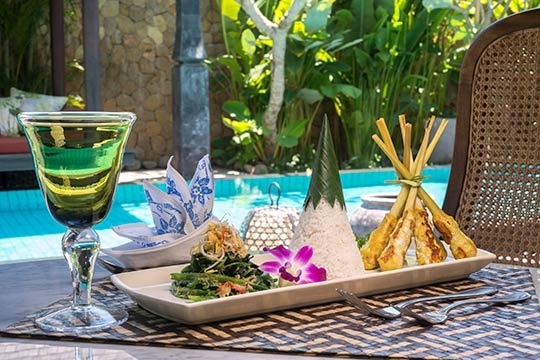 (Note, there is no kitchen at Des Indes Villa II; the chef works from the large kitchen at adjoining Des Indes Villa III. 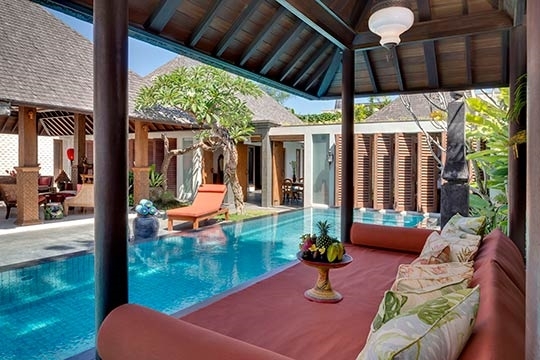 A honeymooning couple, two couples or a family of four will find Des Indes Villa II the perfect choice for their Bali vacation. 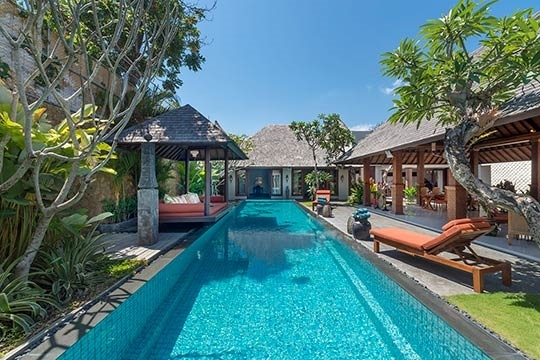 And its Laksmana Estate location is simply outstanding; who wouldn’t relish returning to such a peaceful oasis after enjoying Seminyak’s chic sunset bars and endless stretch of beach a short walk away? 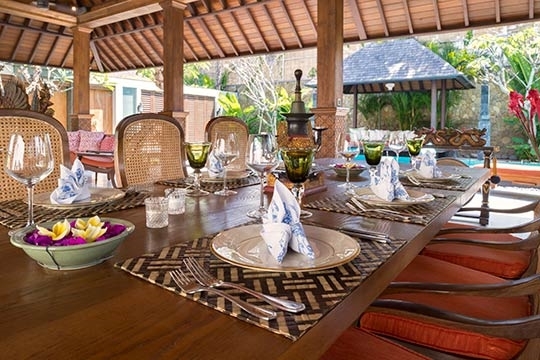 For larger gatherings, Des Indes Villa II can be booked together with the three-bedroom Des Indes Villa III next door, opening up (along a dividing wall of three double doors sandwiched between rows of plantation shutters) to offer five bedrooms and much more living space for socialising. 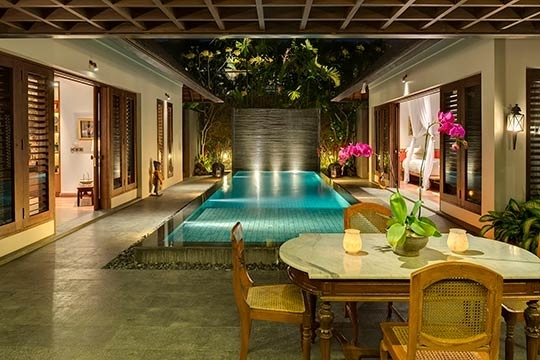 Bali-style open-concept living and Asian heritage chic. 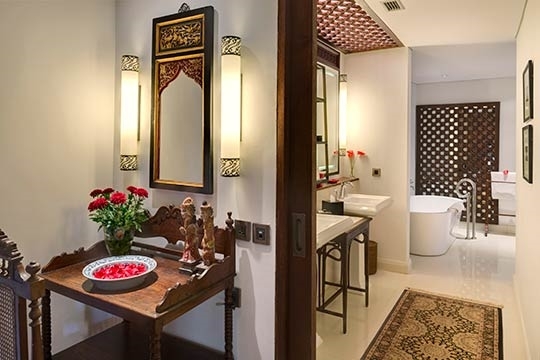 This feels a generous space for a two-bedroom villa, and we loved the profusion of antique-style furniture and fascinating objects d’art – a feast for the eyes. The quirky choice of books was the icing on the cake! The real surprise though was just how quiet it was – hard to believe we were bang smack in the centre of Seminyak. If preparing your own meals is the precursor to a great holiday, then this isn’t the place for you; there’s no on-site kitchen. 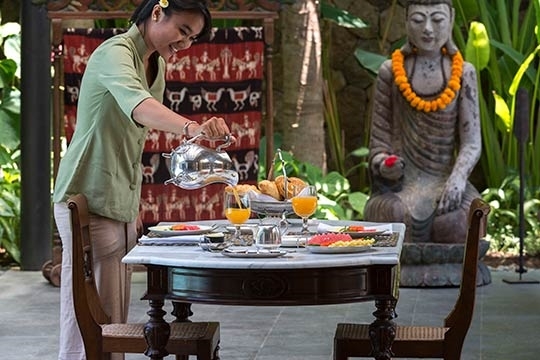 Not to worry though, as the villa chef whips up wonderful meals in the adjacent Des Indes Villa III (breakfast is included in the villa rate and other meals can be selected from a reasonably priced menu). Though no one was staying at Des Indes Villa III at the time, we could imagine that sound might carry. 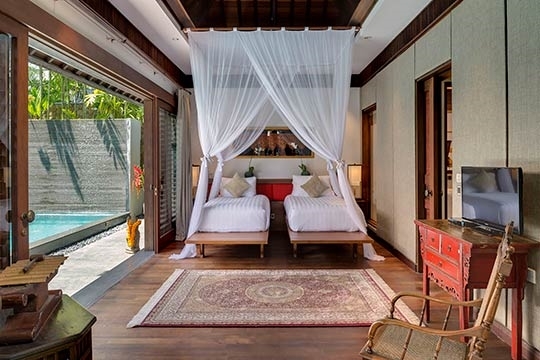 But when both villas are booked together the sense of extra space is stunning. Finally, slather on the repellant provided; like the rest of Seminyak, mosquitos can be a nuisance at certain times of the year! Thank you for an amazing vacation, your accommodations was perfect. 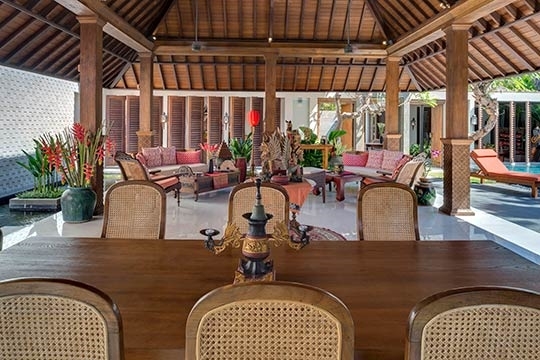 The traditional style villa was just what we were looking for, the entire staff did an exceptional job in providing us with attention, friendliness, caring and warmth. They made us feel like we were home and his will not be the last time we visit. 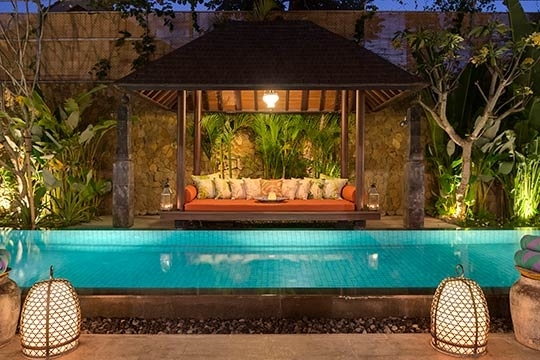 We stay 9 days at Villa Des Indes II and it was a bliss. Beautiful rooms and pools, lovely and helpful staff, excellent location also. Excellent in all respects. Thank you so much for helping me celebrate my 40th. Your hospitality, smiles and helpful manner made it run so smoothly. 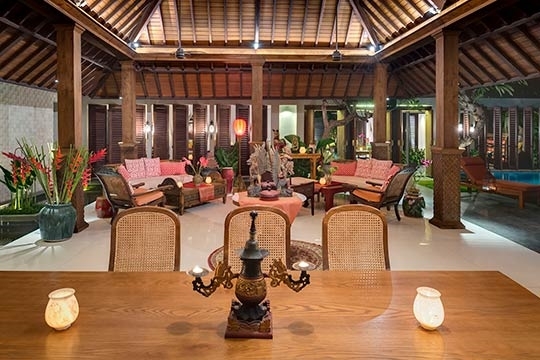 Most authentic Balinese style villa, big clean bedrooms, excellent service and wonderful villa. We celebrate our 10 year wedding anniversary with the renewing of the vows ceremony dinner and drink at Villa Des Indes I, it was perfect. Wonderful, happy, helpful team made our whole 7 days stay an absolute pleasure. Thank you villa Des Indes for a wonderful stay, we had an amazing time in a beautiful villa. Disappointed that our time here has come to an end so quickly. Thank you to friendly, helpful staff who made us fell welcome and pampered. We had a wonderful stay. The hospitality and service was great .The accommodation and atmosphere was fabulous, everyone was polite and friendly. Will definitely recommend it to our friends and family. Thank you for looking after us, we had the best time and the hospitality was world class. Thank you for the service with a smile and for going above and beyond. We will be back. We enjoyed every minute of our stay - stunning villa, great staff and amazing service. Thank you for the amazing time that we had at Villa Des Indes II. We are sad to leave. Thank you to all the wonderful staff for the great service, delicious meals, willingness and patience. Your friendly smiles will always be remembered. Will not hesitate to visit again. Very relaxing villa - lovely staff who looked after us well. You have a beautiful villa with amazing staff - staff are friendly and polite. We have enjoyed every minute and been spoilt rotten. We have had a magnificent stay, very peaceful. Staff have been amazing and very attentive to all our needs. Will look forward to returning again soon. Thank you for your wonderful hospitality and service. 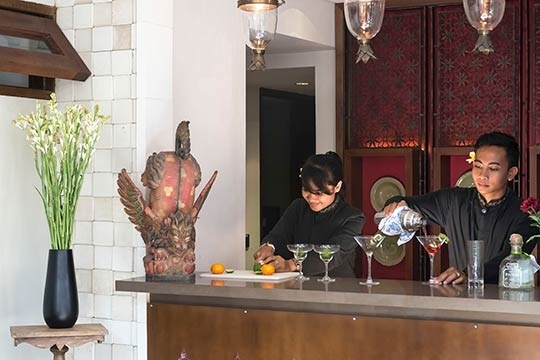 Villa Des Indes are making our Chinese New Year celebration so memorable. Definitely we will be back again to this lovely place. Thank you for the gorgeous stay at Villa Des Indes. We had a wonderful time here and the staff are all fantastic and so helpful, always smiley. We will be back. Thank you so much for your hospitality and our comfortable stay. We will hope to come back to this lovely place soon. 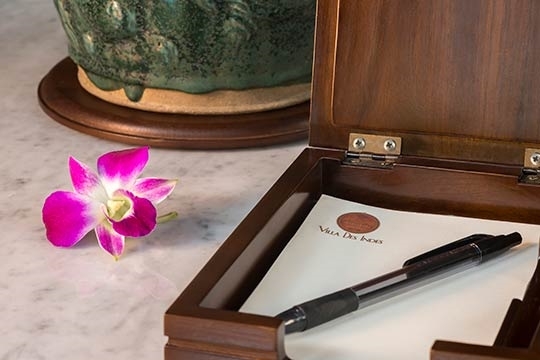 To the fabulous staff at Villa Des Indes II, you have made our stay special in every way. We will always remember the friendliness and care towards our every needs. 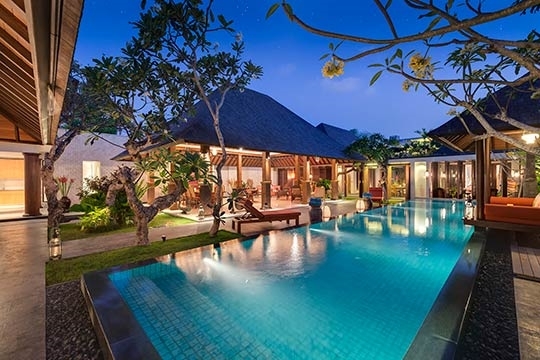 We look forward to seeing you and spending time with you all when we return to beautiful Bali and your beautiful villa. Thank you so much for an amazing time. Could not have chosen a better villa for our holiday. We will be back. 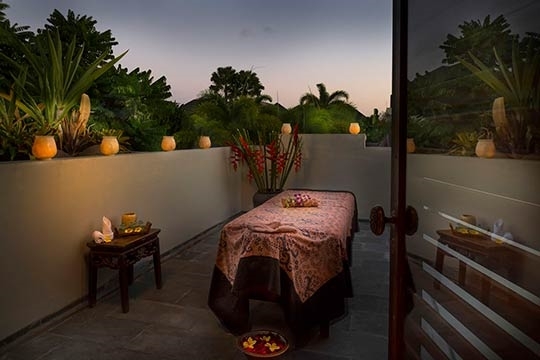 A wonderfull relaxing stay at Villa Des Indes. Ideal for winding down for us. Staff were great and breakfast were decent. All is wonderful. Thank you for your five star service during our 4 nights stay. Made the rain seem lighter and definitely made our stay more memorable. We had a fabulous time here. 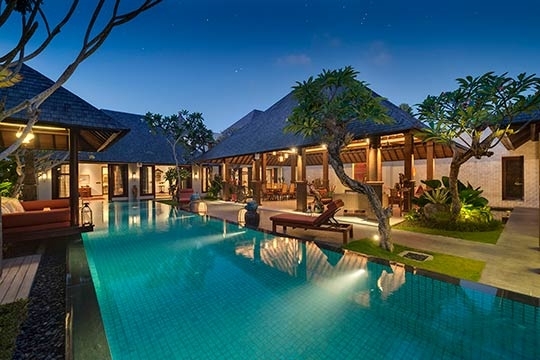 Beautiful villa, beautiful Bali. We had a fabulous time here in Villa Des Indes II, lovely villa and staff. Thank you and we will be back. We had a lovely stay here, the atmosphere and location was great. The staff has been helpful too. These 3 nights were really memorable and would highly recommend this place. 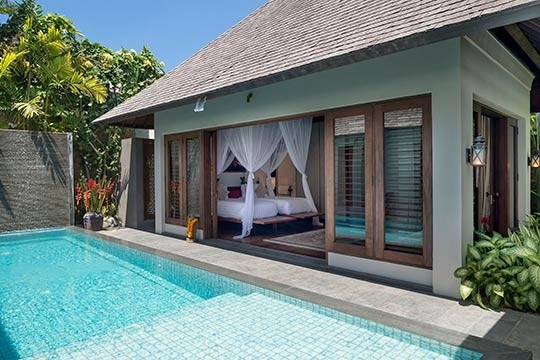 The experience of staying in a villa was like you are at home. The staff was very warm, welcoming and hospitable. Had a lovely time. 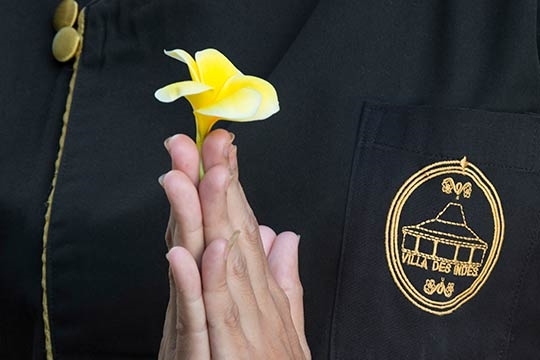 Thank you, we have enjoyed a lovely 7 days relaxing here at Villa Des Indes II fabulous villa, the staff have all been friendly, helpful and always on hand to keep us happy. Love the "bell" bar service too. Thank you for the lovely relaxing time at over 5 nights. 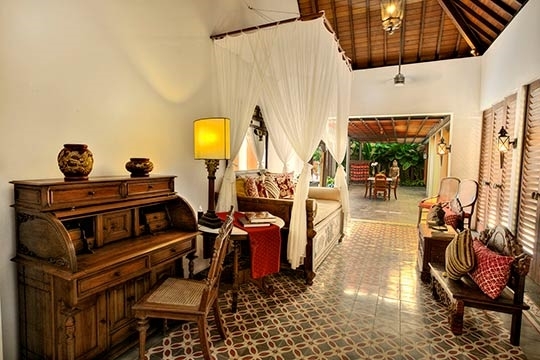 It was a great stay, lovely spot, wonderful atmosphere and the most friendly, loving staff. We will definitely be back. Thank you for the excellence service! Thank you to the team we have had a wonderful time and have been exceptionally well looked after. The only regret we have is we have to leave today. We highly recommend this place for a holiday. The level of service is not only good but consistently good. In fact it was faultless. The villa was amazing and the food is incredible. Thank you for making us feel welcome Des Indes Team. We have really enjoyed our stay here in this beautiful villa. All of the staff were friendly and helpful. We are very lucky to have stayed here and we hope to return someday. It has been a very joyful experience staying at your beautifull property and being looked after by your very loving and caring team. Are already looking forward to coming back. Thank you for your caring, attitude and warm hospitality. We enjoyed our stay. It was so nice to return to your smiling faces after each outing. We so appreciate you treating us like family. Our stay has been truly unforgettable during our dream vacation to Bali. 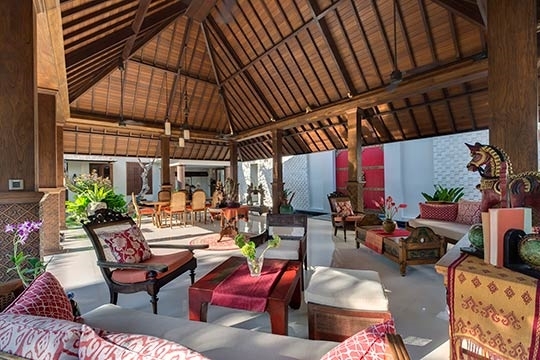 Villa Des Indes is without a doubt a beautiful holiday destination in a superb location. What really makes it special however is the fabulous team behind the scenes. The staff at the villa really make this a villa of choice - friendly, helpful and efficient - fantastic team. Beautiful villa, amazing location - I will be back. Thank you. Thank you for an amazing stay in Villa Des Indes. Absolutely gorgeous environment and service. 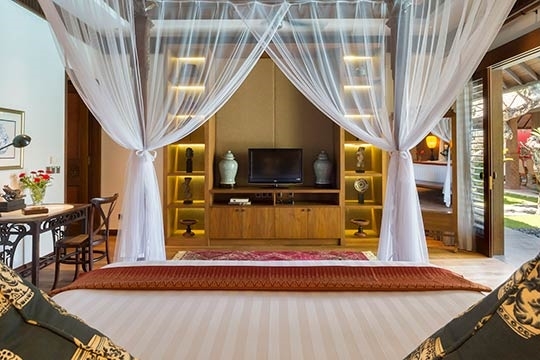 Beautiful design and details, comfortable beds made our holiday truly unforgettable. Thank you for making our stay here so special. The villa is absolutely beautiful, the service and the staff were absolutely perfect. It's been fantastic trip. 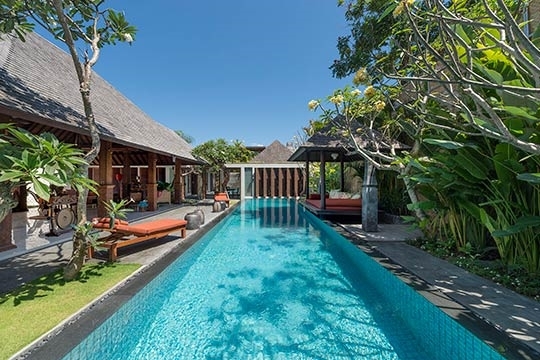 Securely set within the exclusive Laksmana Estate on Bali’s south-western shore, Des Indes Villa II enjoys a gilt-edged location in the most glamorous part of Seminyak. Just 500 metres away is Petitenget Beach, famed for its surf breaks, legendary sunsets and 180-degree coastline view. It’s an easy stroll to many of the island’s most celebrated restaurants and bars, including Ku De Ta, Potato Head and La Lucciola. 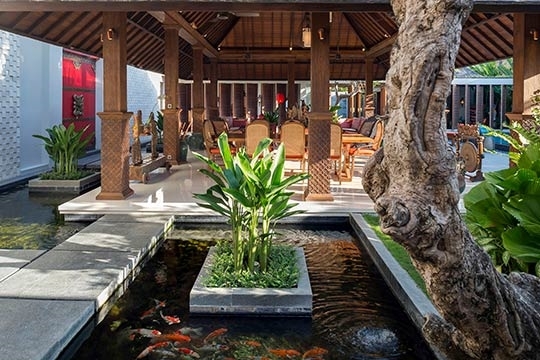 And who needs a taxi for shopping and spa days when Seminyak Square is just around the corner! 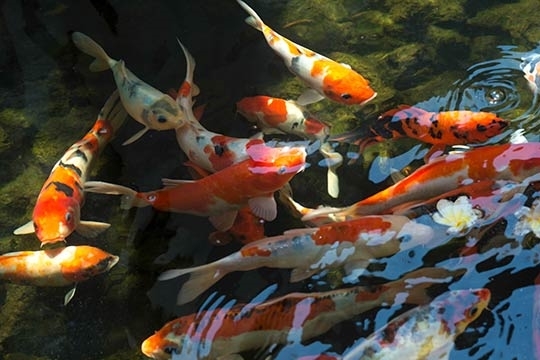 Step past the lacquerware-red entrance door, across a pond lined with saffron-robed mini-monks and directly into the open living area; then you know you’ve stumbled across a secret gem. 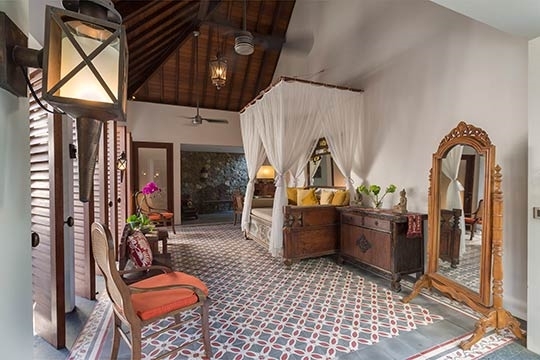 Resting on a floor of traditional patterned tiles is a cluster of stunning Indonesian furniture – including an heirloom roll-top bureau, marble-topped table and deeply cushioned four-poster daybed draped in mosquito netting. Opposite, chairs upholstered in burnt orange line a wall of plantation shutters that are only opened when the villa is booked together with Des Indes Villa III next door. The living space flows seamlessly into a flat-roofed pergola-style dining area where a small marble-topped dining table for four looks across the 16-metre swimming pool topped by a waterfall wall at one end. 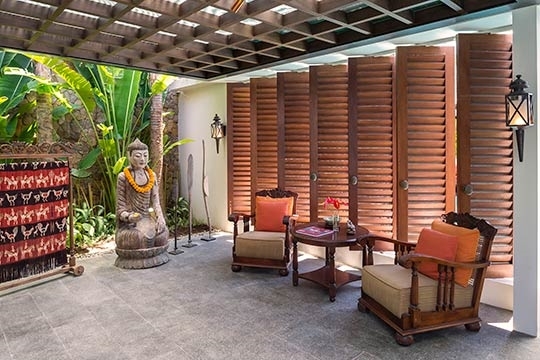 Further along is a reading corner, where two colonial style chairs and a coffee table sit under the gaze of a peaceful garden Buddha, set before a second wall of plantation shutters looking onto Des Indes III’s pool (when open). 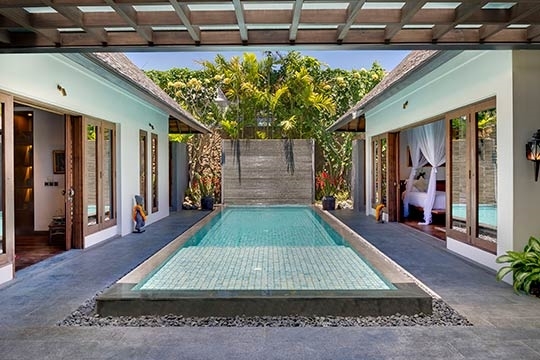 Facing each other across the 10-metre swimming pool in perfect symmetry are the two bedroom pavilions – both with a wall of glass doors opening onto the narrow pool terrace. 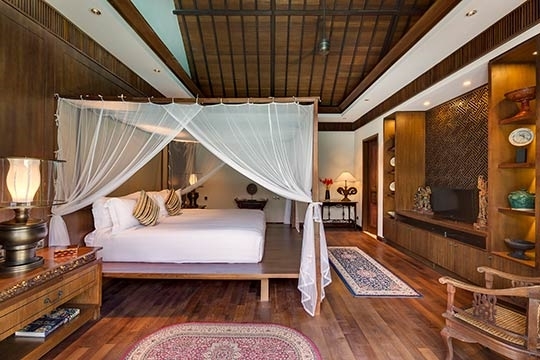 A magnificent four-poster king-size bed is the focus of the richly decorated master bedroom, set before a 47-inch curved TV with satellite channels and DVD player. 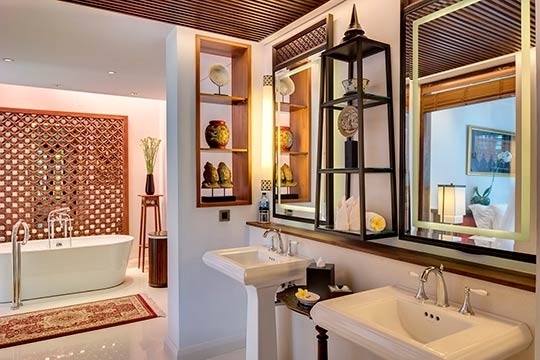 Its equally grand ensuite bathroom has a dressing area, bathtub, twin basins and pool-view monsoon shower enclosure. 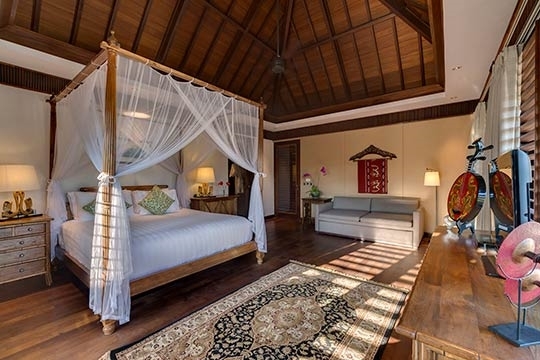 Within the guest pavilion, sitting on an over-sized platform under a tall mosquito net are twin beds that can also be configured as a king. 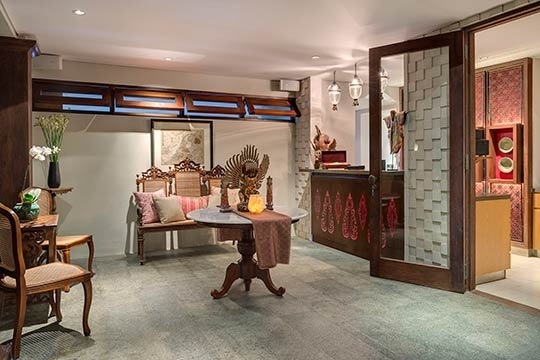 A rocking chair is set before the 43-inch curved TV (with satellite channels and DVD player) and beyond a sliding door in a fabric-paneled wall is a walk-in wardrobe and dressing area. The ensuite bathroom has twin basins, a tub and monsoon shower. Both bedrooms and bathrooms are air-conditioned, and there’s also a ceiling fan in the bedrooms. 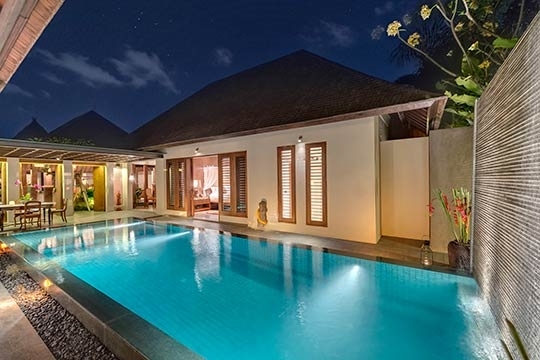 5 bedroom villa located in Seminyak, Bali. Ideal for Beach in ten, Kid friendly, Walk into town. 8 out of 10 based on 35 user reviews.